Takeaway: Data science is currently one of the hottest fields in tech, but getting a job in the field can depend on the proper training and experience. In today’s day and age, more and more companies are seeing the value in data-driven technologies, such as artificial intelligence and automation. As such, the need for highly skilled and qualified data scientists has only continued to go up. As a matter of fact, according to statistics from IBM, the demand for data scientists will increase 28% by the year 2020. This video can explain better about what data science is and why it’s blooming nowadays. Why Go For a Data Science Course? The data science field is growing quickly, and more employers are recognizing the value in those skilled in data science. In fact, Indeed.com has reported that job postings for data scientists increased by 75% over a recent three-year period. Although the demand for data scientists is undeniably high, so is the competition. Because this can also be a lucrative career field to pursue, more individuals are doing what they can to become trained in the field of data science and to stand out amongst other applicants. In other words, if you’re serious about pursuing a career in data science, it’s critical to get the proper training. The first step in getting certified as a data scientist is to enroll in an accredited data science course that can teach you everything you need to know to succeed in the field – from the fundamentals to advanced skills. While there are free online sources that can offer some good tips for learning data science, nothing beats enrolling in a structured, accredited program that provides instruction from industry professionals, which can also award you with a professional certification upon completion. If you’re looking for a course that keeps students updated with the latest trends in data science and offers practical knowledge in its instruction, one good option is Simplilearn’s Data Scientist Master’s Program. One of the best things about pursuing a certification in data science? The majority of data science courses these days are taught online. This means it’s more convenient than ever to learn a new skill and get certified. Online classes offer a level flexibility that no other method of learning provides. You can work at your own pace, study when you want, and pick a course schedule that best suits your other commitments. You can also complete your coursework on any supported device with a stable internet connection, anywhere in the world. If you’re wondering when to begin, there is no better time than now, especially if you want to get ahead of your peers. If you’re looking for some more inspiration, consider some of the following benefits of enrolling in a data science course. If you’re looking for a way to jump start your career, earning your data science certification is an important step to take. Even if you’re already experienced in data science, a professional certification from an advanced data science course can still help you grow in your career, stand out amongst the competition, and even increase your earning potential. In fact, Business Wire revealed through a study that professionals typically saw a salary increase ranging anywhere from 20% to 40% after getting certified. If you’re looking to get certified in a field where you’ll always have a lot of options and never be bored in your line of work, data science is the way to go. There are so many different industries leveraging the power of data science, from healthcare to finance, to retail and entertainment. In reality, just about every industry and company these days is recognizing the importance of data and the need for qualified data scientists. Have you ever dreamed of working for a Fortune 500 company, such as Amazon or Facebook? If so, earning a data science certification can be your first step at landing you a job at one of the many Fortune 500 companies actively hiring data scientists. It’s also important to think about location when considering what line of work to pursue and what to get certified in. As a certified data scientist, you’ll have the freedom and flexibility to work all around the world. Specifically, countries like Italy, the United Kingdom, the United States, India, France and Germany have been employing certified data scientists at a steady pace. 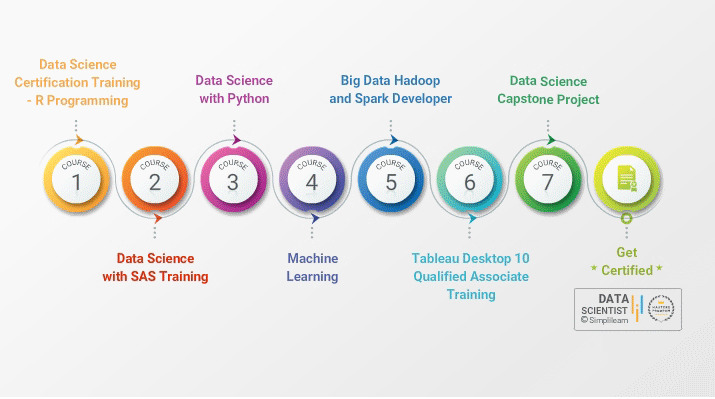 Don’t forget about the different roles and opportunities that a data science certification can make you eligible for, either. Aside from just qualifying as a data scientist, a professional data science certification can land you a job as a data engineer, data architect, research scientist or a business analyst, just to name a few. Some people decide to just improve on their skills by watching free videos online or reading blogs and tips from websites. Even though this information can come from reputable sources, these free sources don’t offer a structured learning approach. When you decide to learn on your own, it will usually take a lot of discipline to commit yourself to learning what’s needed to succeed as a data scientist. It’s also easy to miss important lessons that you’d otherwise get with a structured education program, as you’ll likely only get bits and pieces of information through free sources. A structured education program provides students with everything they need to master data science in a logical, organized manner. Because data science can be complex, having this structure – even if you already have some data science experience – is essential. Data science is constantly evolving, and data scientists are always using new and innovative tools to make their jobs more efficient. Without enrolling in a data science course, it can be difficult to learn about all of the popular data science tools that are used today. However, this is an important skill for any data scientist. Different companies use different tools, so if you’re accustomed to only using specific ones, it’s important to expand your skill set and learn about all the different data science tools out there. This way, once you’re certified and on your next job interview, you can confidently tell your interviewer that you’re experienced with the data science tools that are used at their company. When you enroll in a data science course, some of the popular data science tools (as well as programming tools, which can complement your job as a data scientist) you’ll learn about include Apache HBase, HDFS, Hadoop, Python, R, Scala and so on. It’s possible to learn various theoretical concepts from videos, books or even from college courses. But only a practical certification course, such as Simplilearn's Big Data and Data Science Master’s Program, will have industry experts demonstrating how to apply those concepts to actual business problems. When applying for a new job, employers take various factors into consideration when evaluating your experience. Sometimes, on-the-job experience can showcase your expertise in a particular field. Other times, hands-on experience through a recognized course certification can also show potential employers that you’re knowledgeable and qualified. You may be especially unstoppable if you have on-the-job experience, plus a professional data science certification. Companies recognize and appreciate the fact that enrolling in an education program and getting certified can be challenging. Not only do students have to study and work hard in order to succeed, but they often have other responsibilities to deal with, such as family life and a full-time job. By making the decision to enroll in a course, it shows potential employers just how serious and passionate you are when it comes to data science, and it demonstrates your level of dedication. It also tells more about the person’s character: This is someone who, even with an already jam-packed schedule, made the decision to better themselves and get certified. As busy as this person was, they still successfully completed the program and became certified. In other words, this is someone who is committed, works well under pressure and can meet deadlines. These are all valuable traits in any employee, but especially for someone who wants to work in data science. With Simplilearn’s LVC (Live Virtual Constructive) learning mode, students get to learn a lot from industry experts. Also, students have the opportunity to interact with professional data scientists and clear any doubts with them. It gives students the chance to network with experts and peers in the data science industry, which is another added perk of enrolling in a structured data science education program. Simplilearn’s Data Science with SAS Certification Training is just one of many exciting programs that utilizes LVC technology. If you’re ready to stand out amongst the competition and make a big impression on potential employers, there is no better time than now to earn your data science certification if you’re serious about pursuing a career in data science.